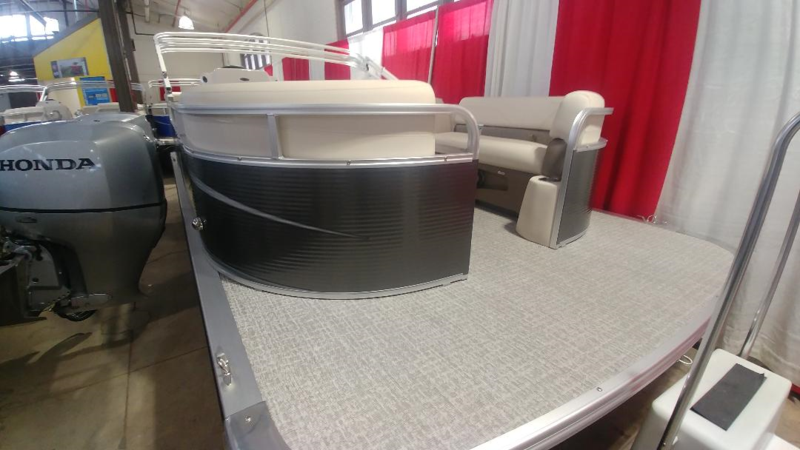 The latest technology, the finest materials and the best people create Tahoe Pontoons. 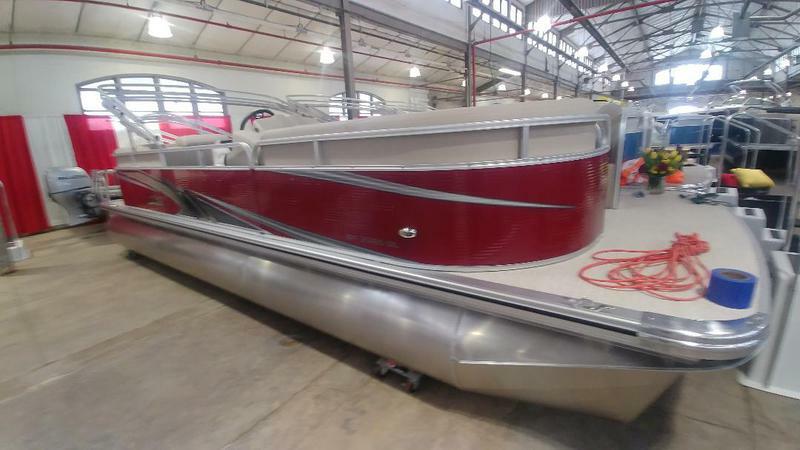 We have been building the finest U.S.A. made pontoon boats Since 1994. 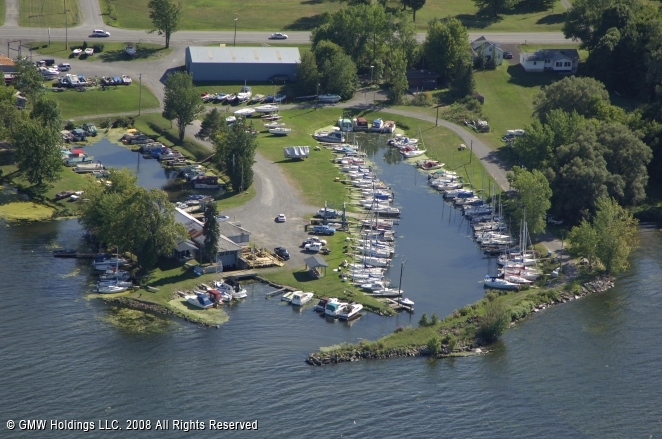 Tahoe is a vertically integrated builder, meaning, all boat parts are built In-House, here in the USA. 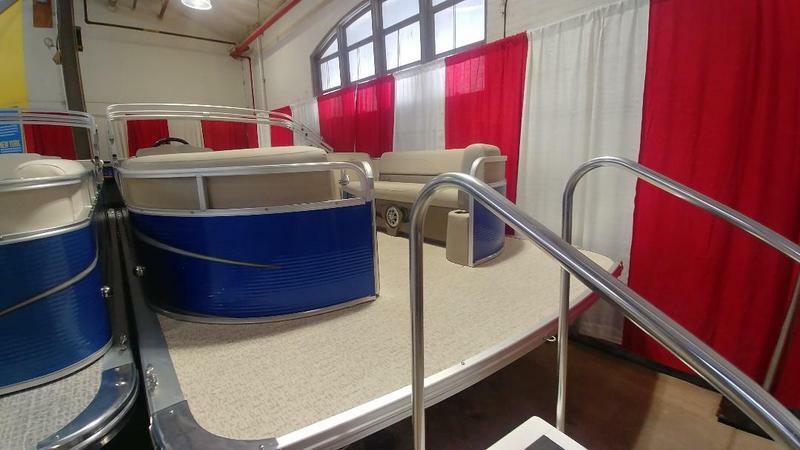 We manufacture the pontoons, framing, furniture, covers and more right in our own production facility. So, unlike our competitors who outsource most components, we are able to achieve and control the highest degree of quality. Investment in the latest equipment has allowed us to produce the highest quality pontoon on the market. New technology such as our water jet cutter provides a smoother finish and more accurate dimensions. Our computer driven Gerber fabric cutters create exacting furniture patterns for excellent fit and finish. Electronic saws make sure all aluminum is cut to precise dimensions. The latest in welding technology gives your boat the superior finish you expect. Our number one investment, however, is our people. Tahoe’s team of highly experienced welders, furniture makers and assemblers descend from generations of Midwestern craftsmen that have been instrumental in the building of America. Our headquarters based customer service people will make sure your experience is exceptional. Tahoe is rated as having one of the lowest incidents of warranty claims in the industry and has also won the NMMA CSI Award since 2008 for outstanding customer service. standards for critical components such as electrical systems, powering, flotation, fuel systems and navigation lights. U.S. Coast Guard statistics NMMA Certified boats have been shown to be safer than non-certified boats. ADDED OPTIONS INCLUDED IN PRICE: Aluminum Prop, Individual Seat Covers, Full ATD Vinyl Floor, Buckskin Interior Seat Vinyl, Privacy Station, Mechanical Tilt Steering, Stereo w/USB Auxiliary Input & 4 Speakers, 8 1/2' Wide w/25” Pontoons, Interior Mood Lighting, Table, Windshield, Nav/Dock Light Combo, 29 Gallon Fuel Tank & Chrome Package. ADDED OPTIONS INCLUDED IN PRICE: Stainless Steel Prop, Individual Seat Covers, Full ATD Vinyl Floor, Buckskin Interior Seat Vinyl, Privacy Station, Sea Star Hydraulic Steering, Stereo w/USB Auxiliary Input & 4 Speakers, 8' Wide w/Triple 25” Pontoons, Interior Mood Lighting Package, Under Rub Rail Lighting, Garmin GPS, Ski Tow Bar, Matching Deluxe Captain's Chairs, Table, Windshield, Nav/Dock Light Combo, 38 Gallon Fuel Tank & Chrome Package. ADDED OPTIONS INCLUDED IN PRICE: Aluminum Prop, Individual Seat Covers, Full ATD Vinyl Floor, Buckskin Interior Seat Vinyl, Privacy Station, Mechanical Tilt Steering, Stereo w/USB Auxiliary Input & 4 Speakers, 8 1/2' Wide w/25” Pontoons, Table, Windshield, Nav/Dock Light Combo, 29 Gallon Fuel Tank, Rear Fishing Station w/Livewell, & Chrome Package. 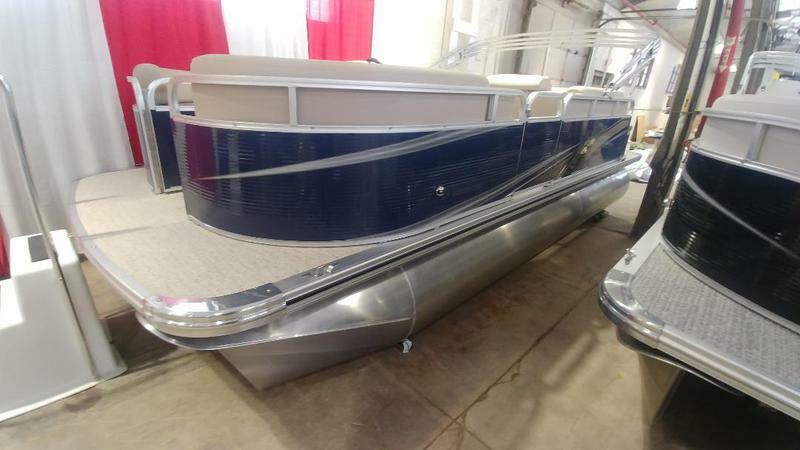 ADDED OPTIONS INCLUDED IN PRICE: Stainless Steel Prop, Individual Seat Covers, Full Mist Vinyl Floor, Buckskin Interior Seat Vinyl w/Black Seat Accents, Privacy Station, SeaStar Hydraulic Steering, Stereo w/USB Auxiliary Input & 4 Speakers, 8 1/2' Wide w/Triple 25” Pontoons, Ski Tow Bar, Table, Windshield, Nav/Dock Light Combo, 38 Gallon Fuel Tank, Rear Fishing Station w/Livewell, Blue Ice Interior Lighting Package, Under Rub Rail Lights, Upgraded Fishing Chairs, & Chrome Package. 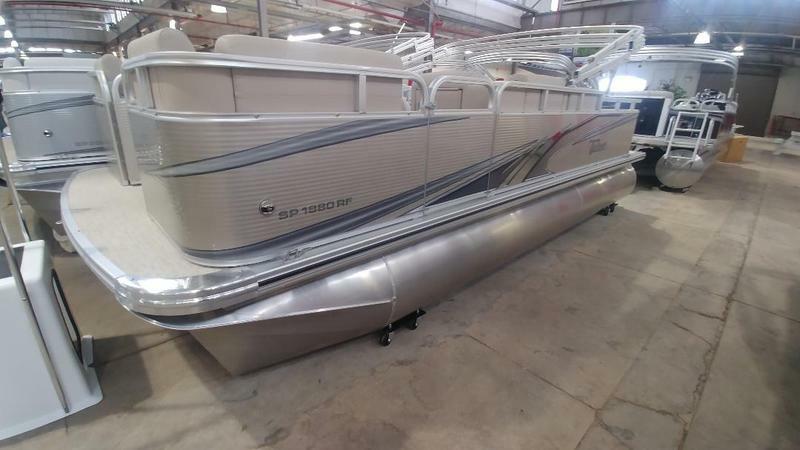 ADDED OPTIONS INCLUDED IN PRICE: Stainless Steel Prop, Individual Seat Covers, Full ATD Vinyl Floor, Buckskin Interior Seat Vinyl, Privacy Station, BayStar Hydraulic Steering, Stereo w/USB Auxiliary Input & 4 Speakers, 8 1/2' Wide w/HP 25” Pontoons, Ski Tow Bar, 2 Upgraded Admiral's Chairs, Table, Windshield, Chrome LED Dock Lights, 29 Gallon Fuel Tank, Interior Mood Lighting Package, & Chrome Package. 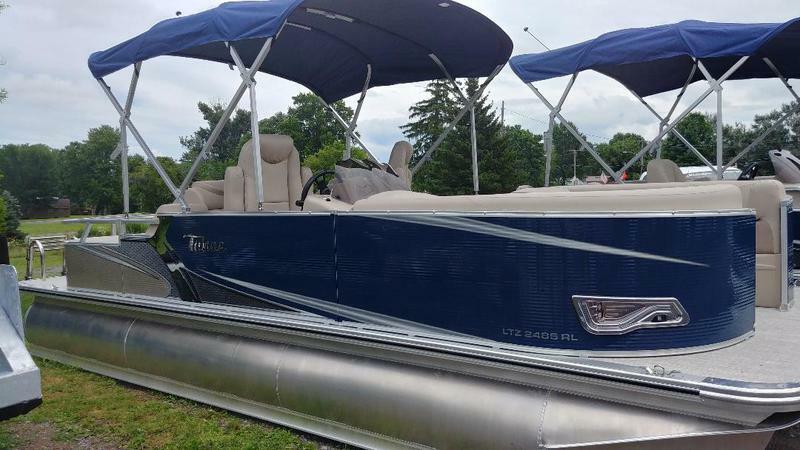 ADDED OPTIONS INCLUDED IN PRICE: Aluminum Propeller, Individual Seat Covers, Full Shore Vinyl Floor, Mechanical Tilt Steering, Cream & Oak Barrel Interior, Stereo w/USB Aux Input & 4 Speakers, 8' Wide w/25" Pontoons, Table, Windshield, 15 Gallon Fuel Tank, & Chrome Package. 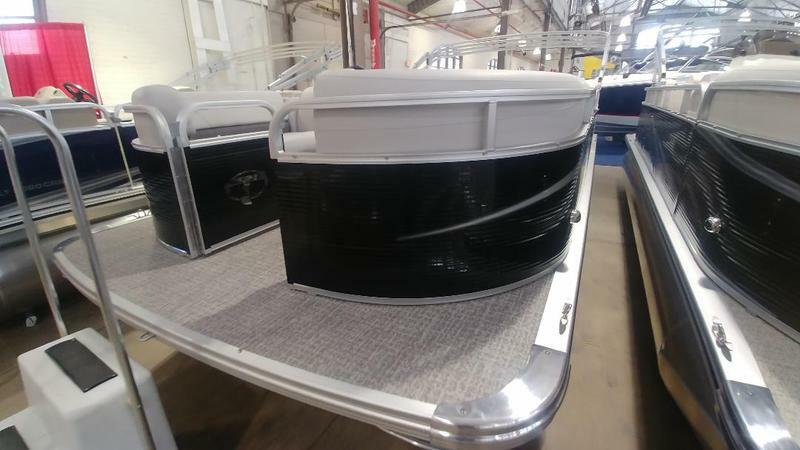 ADDED OPTIONS INCLUDED IN PRICE: Aluminum Propeller, Individual Seat Covers, Full Mist Vinyl Floor, Mechanical Tilt Steering, Silver & Oyster Shell Interior, Privacy Station, Stereo w/USB Auxiliary Input & 4 Speakers, 8' Wide w/25" Pontoons, Table, Windshield, 15 Gallon Fuel Tank, & Chrome Package. 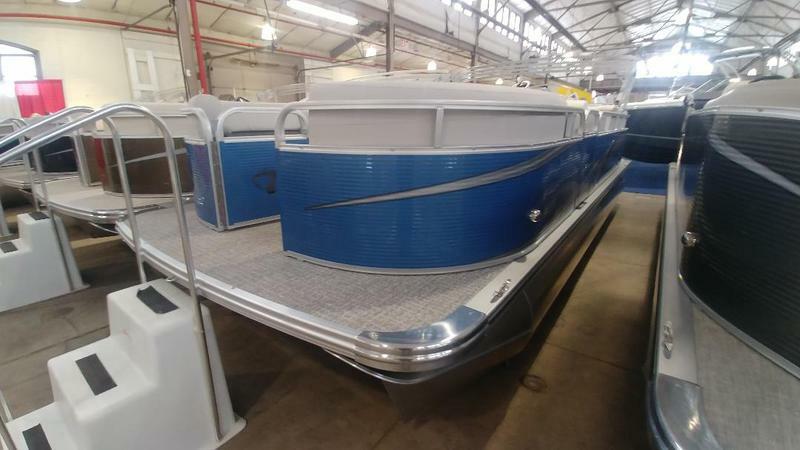 ADDED OPTIONS INCLUDED IN PRICE: Aluminum Propeller, Individual Seat Covers, Full Shore Vinyl Floor, Mechanical Tilt Steering, Buckskin & Neutra Interior, Privacy Station, Stereo w/USB Aux Input & 4 Speakers, 8' Wide w/25" Pontoons, Table, Windshield, 15 Gallon Fuel Tank, & Chrome Package. 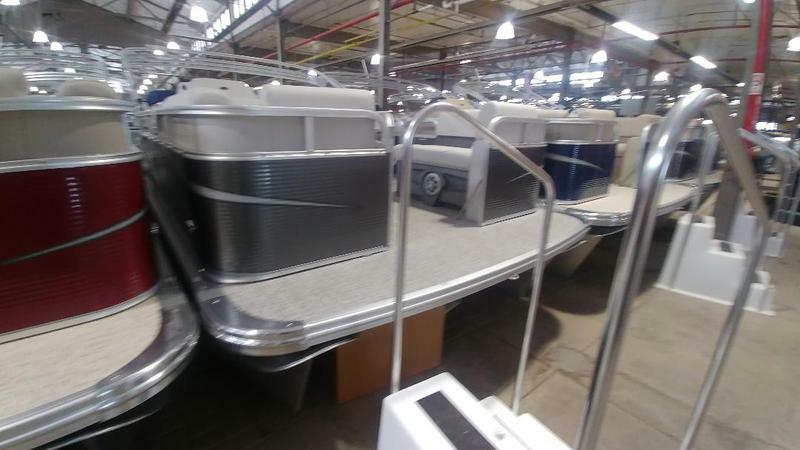 ADDED OPTIONS INCLUDED IN PRICE: Aluminum Propeller, Individual Seat Covers, Full Shore Vinyl Floor, Privacy Station, Mechanical Tilt Steering, Buckskin & Neutra Interior, Stereo w/USB Aux Input & 4 Speakers, 8' Wide w/23" Pontoons, Table, Windshield, Rear Fishing Station w/Livewell, 15 Gallon Fuel Tank, & Chrome Package. 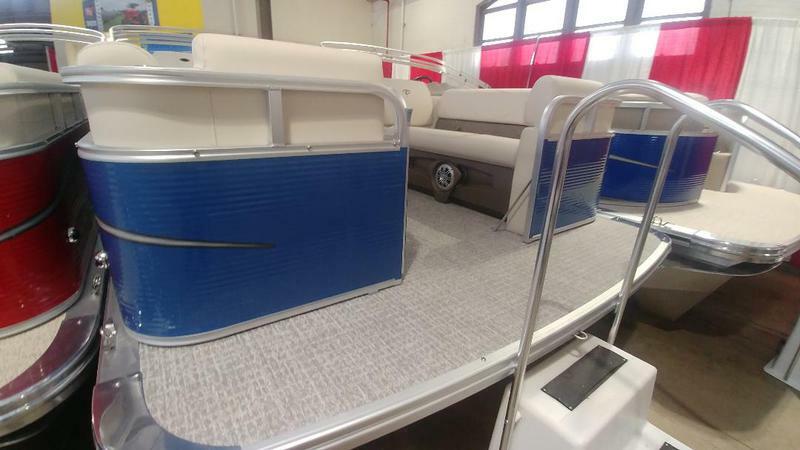 ADDED OPTIONS INCLUDED IN PRICE: Aluminum Propeller, Individual Seat Covers, Full Shore Vinyl Floor, Mechanical Tilt Steering, Cream & Neutra Interior, Privacy Station, Stereo w/USB Aux Input & 4 Speakers, 8' Wide w/25" Pontoons, Table, Windshield, 15 Gallon Fuel Tank, & Chrome Package. 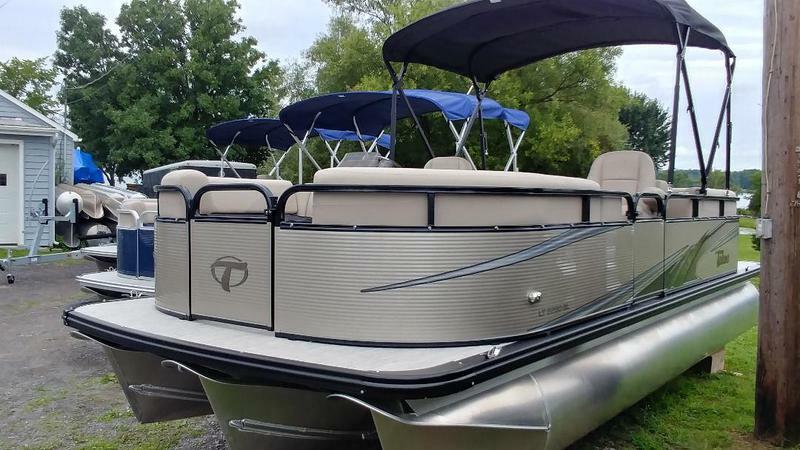 ADDED OPTIONS INCLUDED IN PRICE: Aluminum Propeller, Individual Seat Covers, Full Mist Vinyl Floor, White & Oak Barrel Interior, Mechanical Tilt Steering, Privacy Station, Stereo w/USB Aux Input & 4 Speakers, 8' Wide w/25" Pontoons, Table, Windshield, 15 Gallon Fuel Tank, & Chrome Package. 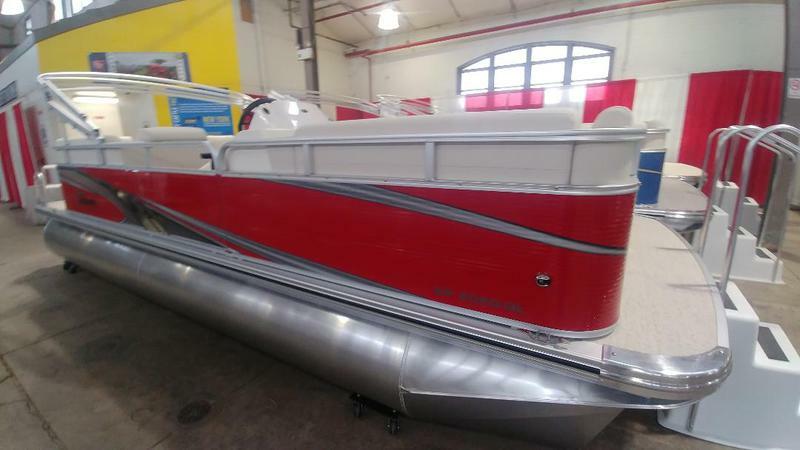 ADDED OPTIONS INCLUDED IN PRICE: Aluminum Propeller, Individual Seat Covers, Full Shore Vinyl Floor, Mechanical Tilt Steering, Buckskin & Neutra Interior, Privacy Station, Stereo w/USB Aux Input & 4 Speakers, 8' Wide w/25" Pontoons, Interior Mood Lighting, Table, Windshield, 25 Gallon Fuel Tank, & Chrome Package. 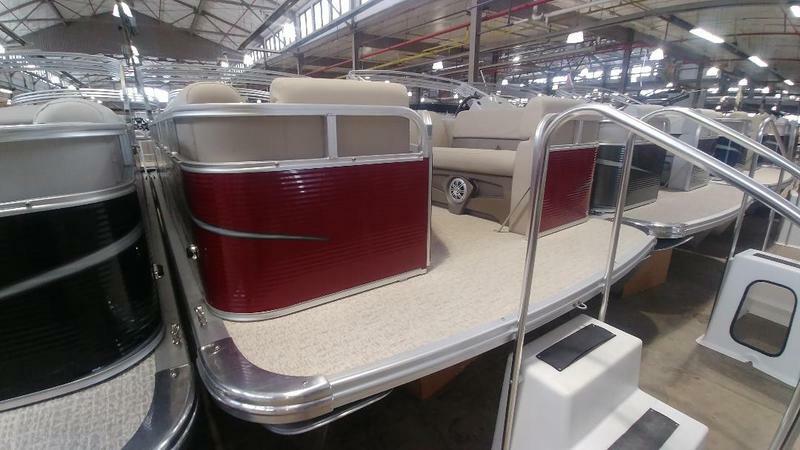 ADDED OPTIONS INCLUDED IN PRICE: Aluminum Propeller, Individual Seat Covers, Full Shore Vinyl Floor, Mechanical Tilt Steering, Buckskin & Neutra Interior, Privacy Station, Stereo w/USB Aux Input & 4 Speakers, 8 ½’ Wide w/25" Pontoons, Table, Windshield, Nav/Dock Light Combo, 25 Gallon Fuel Tank, & Chrome Package. ADDED OPTIONS INCLUDED IN PRICE: Aluminum Propeller, Individual Seat Covers, Full Mist Vinyl Floor, Mechanical Tilt Steering, Cream & Neutra Interior, Privacy Station, Stereo w/USB Aux Input & 4 Speakers, 8' Wide w/25" Pontoons, Interior Mood Lighting, Table, Windshield, Nav/Dock Light Combo, 25 Gallon Fuel Tank, & Chrome Package. 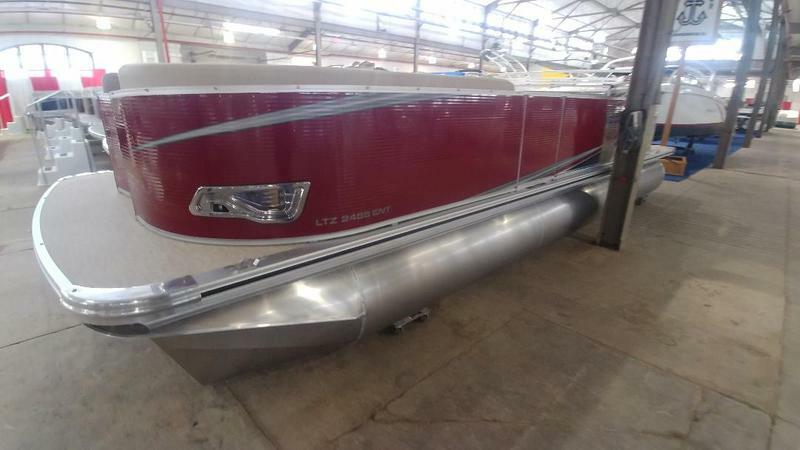 ADDED OPTIONS INCLUDED IN PRICE: Aluminum Propeller, Individual Seat Covers, Full Shore Vinyl Floor, Mechanical Tilt Steering, Cream & Oak Barrel Interior, Privacy Station, Stereo w/USB Aux Input & 4 Speakers, 8' Wide w/25" Pontoons, Interior Mood Lighting, Table, Windshield, Nav/Dock Light Combo, 25 Gallon Fuel Tank, & Chrome Package. ADDED OPTIONS INCLUDED IN PRICE: Aluminum Propeller, Individual Seat Covers, Full Mist Vinyl Floor, Mechanical Tilt Steering, Silver & Oyster Shell Interior, Privacy Station, Stereo w/USB Aux Input & 4 Speakers, 8' Wide w/25" Pontoons, Interior Mood Lighting, Table, Windshield, Nav/Dock Light Combo, 25 Gallon Fuel Tank, & Chrome Package. 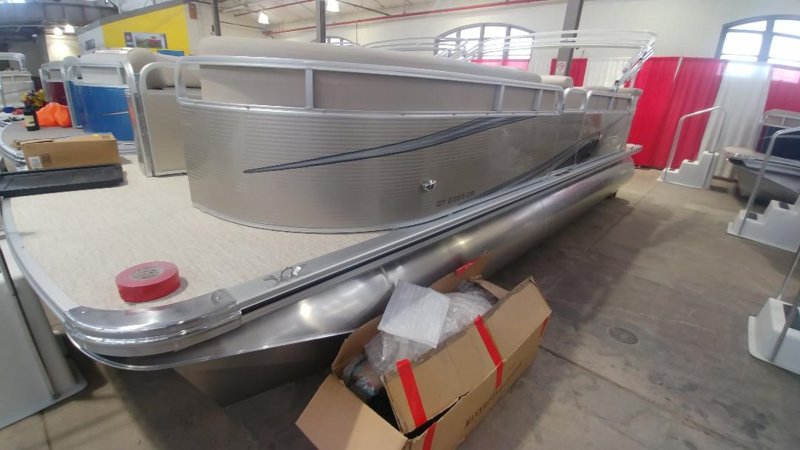 ADDED OPTIONS INCLUDED IN PRICE: Aluminum Propeller, Individual Seat Covers, Full Mist Vinyl Floor, Mechanical Tilt Steering, Silver w/Oyster Shell Interior, Privacy Station, Stereo w/USB Aux Input & 4 Speakers, Starboard Bar, 8' Wide w/25" Pontoons, Interior Mood Lighting, Table, Windshield, Nav/Dock Light Combo, 25 Gallon Fuel Tank, 3 Upgraded Cadet Captain’s Chairs, & Chrome Package. 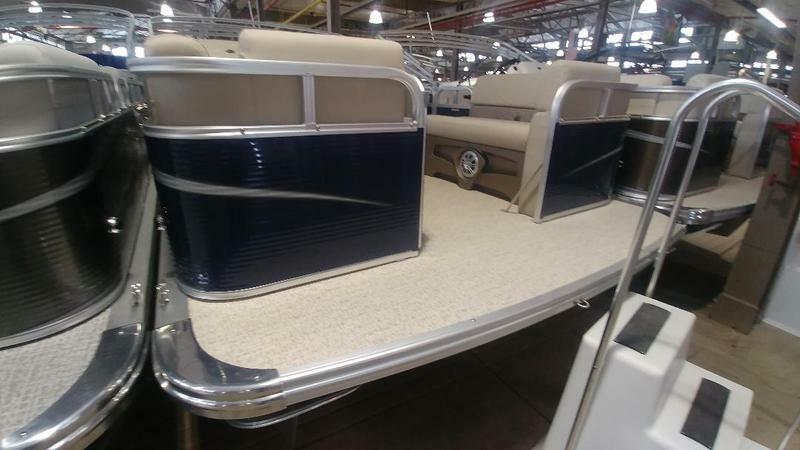 ADDED OPTIONS INCLUDED IN PRICE: Aluminum Propeller, Individual Seat Covers, Full Shore Vinyl Floor, Mechanical Tilt Steering, Buckskin & Neutra Interior, Privacy Station, Stereo w/USB Aux Input & 4 Speakers, 8 ½’ Wide w/25" Pontoons, Table, Windshield, Interior Mood Lighting, Nav/Dock Light Combo, 25 Gallon Fuel Tank, & Chrome Package. ADDED OPTIONS INCLUDED IN PRICE: Aluminum Propeller, Individual Seat Covers, Full Mist Vinyl Floor, Mechanical Tilt Steering, Silver & Oyster Shell Interior, Privacy Station, Stereo w/USB Aux Input & 4 Speakers, 8 ½’ Wide w/25" Pontoons, Table, Windshield, Blue Ice Interior Mood Lighting, Under Rub Rail Lighting, Chrome LED Dock Lights, 25 Gallon Fuel Tank, & Chrome Package. 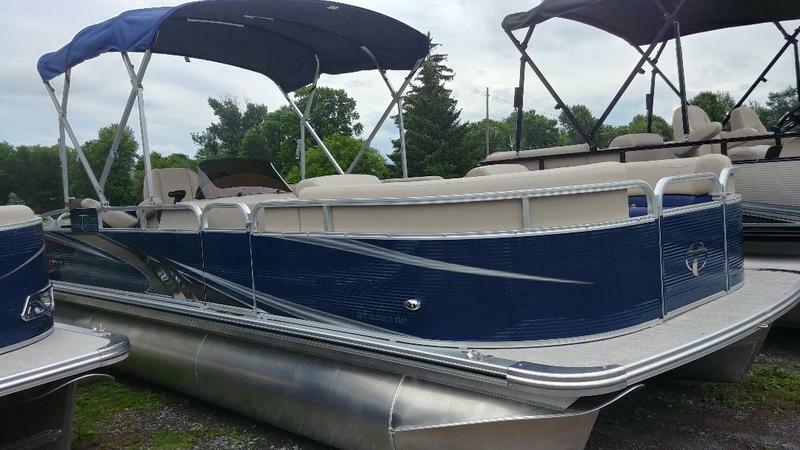 ADDED OPTIONS INCLUDED IN PRICE: Aluminum Propeller, Individual Seat Covers, Full Shore Vinyl Floor, BayStar Hydraulic Tilt Steering, Buckskin & Oak Barrel Interior, Privacy Station, Stereo w/USB Aux Input & 4 Speakers, 8 ½’ Wide w/25" Pontoons, Table, Windshield, 25 Gallon Fuel Tank, Under Rubrail Lighting, Blue Ice Interior Light Package, Chrome Dock Lights, Ski Tow Bar, Lighted Wall Vents, & Chrome Package. 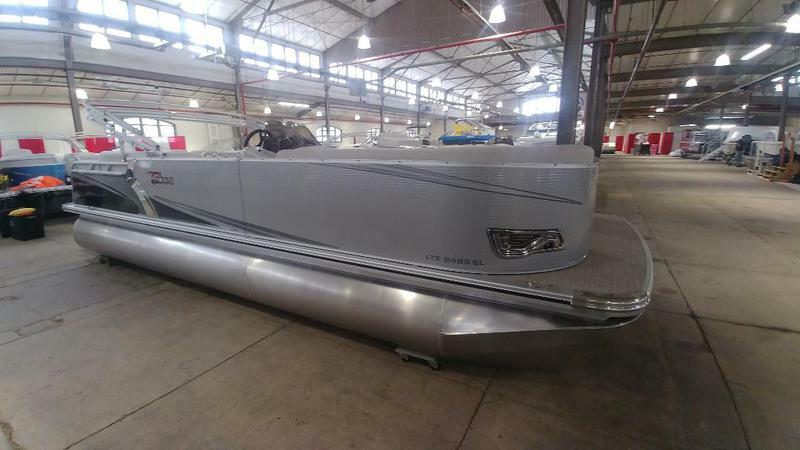 ADDED OPTIONS INCLUDED IN PRICE: Stainless Steel Propeller, Individual Seat Covers, Full Mist Vinyl Floor, BayStar Hydraulic Tilt Steering, Silver & Black Interior, Privacy Station, Stereo w/USB Aux Input & 4 Speakers, 8 ½’ Wide w/25" Pontoons w/HP Lifting Strakes, Table, Windshield, 25 Gallon Fuel Tank, Under Rubrail Lighting, Blue Ice Interior Light Package, Chrome Dock Lights, Lighted Wall Vents, & Chrome Package. ADDED OPTIONS INCLUDED IN PRICE: Aluminum Propeller, Individual Seat Covers, Full Mist Vinyl Floor, BayStar Hydraulic Tilt Steering, Silver & Caribbean Blue Interior, Privacy Station, Stereo w/USB Aux Input & 4 Speakers, 8 ½’ Wide w/25" Pontoons w/HP Lifting Strakes, Table, Windshield, 25 Gallon Fuel Tank, Under Rubrail Lighting, Blue Ice Interior Light Package, Chrome Dock Lights, Ski Tow Bar, Lighted Wall Vents, & Chrome Package. ADDED OPTIONS INCLUDED IN PRICE: Aluminum Propeller, Individual Seat Covers, Full Silver BTT Vinyl Floor, BayStar Hydraulic Tilt Steering, Silver & Beachwood Interior, Stereo w/USB Aux Input & 4 Speakers, 8 ½’ Wide w/25" Pontoons w/HP Lifting Strakes, Table, Windshield, 25 Gallon Fuel Tank, Under Rubrail Lighting, Blue Ice Interior Light Package, Chrome Dock Lights, Ski Tow Bar, Lighted Wall Vents, & Chrome Package. ADDED OPTIONS INCLUDED IN PRICE: Aluminum Propeller, Individual Seat Covers, Full Mist Vinyl Floor, BayStar Hydraulic Tilt Steering, Buckskin & Neutra Interior, Privacy Station, Stereo w/USB Aux Input & 4 Speakers, 8 ½’ Wide w/25" Pontoons, Table, Windshield, 25 Gallon Fuel Tank, Under Rubrail Lighting, Blue Ice Interior Light Package, Chrome Dock Lights, & Chrome Package. ADDED OPTIONS INCLUDED IN PRICE: Stainless Steel Propeller, Individual Seat Covers, Full Mist Vinyl Floor, BayStar Hydraulic Tilt Steering, Buckskin & Oak Barrel Interior, Privacy Station, Stereo w/USB Aux Input & 4 Speakers, 8 ½’ Wide w/25" Pontoons w/HP Lifting Strakes, Table, Windshield, 25 Gallon Fuel Tank, Under Rubrail Lighting, Blue Ice Interior Light Package, Chrome Dock Lights, Ski Tow Bar, Lighted Wall Vents, & Chrome Package. ADDED OPTIONS INCLUDED IN PRICE: Aluminum Propeller, Individual Seat Covers, Full Mist Vinyl Floor, Mechanical Tilt Steering, Silver & Oyster Shell Interior, Privacy Station, Stereo w/USB Aux Input & 6 Speakers, 8 ½’ Wide w/25" Pontoons, Table, Windshield, 25 Gallon Fuel Tank, Under Rubrail Lighting, Blue Ice Interior Light Package, Ski Tow Bar, Chrome Dock Lights, & Chrome Package. ADDED OPTIONS INCLUDED IN PRICE: Stainless Steel Propeller, Individual Seat Covers, Full Mist Vinyl Floor, BayStar Hydraulic Tilt Steering, Silver & Black Interior, Privacy Station, Stereo w/USB Aux Input & 4 Speakers, 8 ½’ Wide w/25" Pontoons, Table, Windshield, 25 Gallon Fuel Tank, Under Rubrail Lighting, Blue Ice Interior Light Package, Ski Tow Bar, Chrome Dock Lights, & Chrome Package. 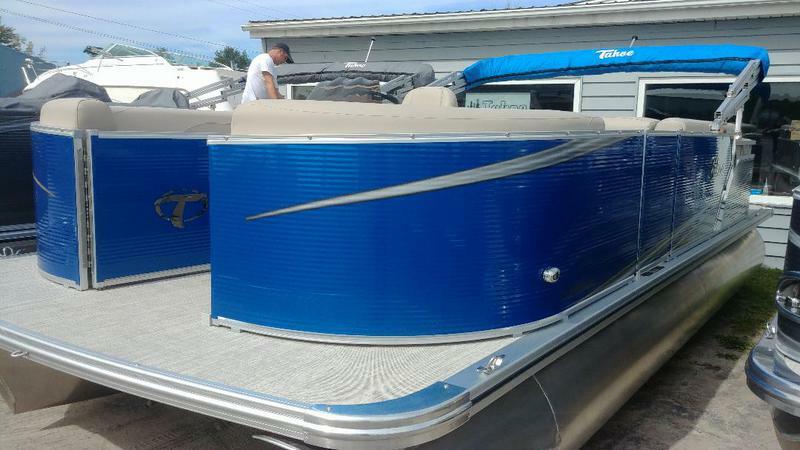 ADDED OPTIONS INCLUDED IN PRICE: Stainless Steel Propeller, Individual Seat Covers, Full Shore Vinyl Floor, BayStar Hydraulic Tilt Steering, Buckskin & Neutra Interior, Privacy Station, Stereo w/USB Aux Input & 4 Speakers, 8 ½’ Wide w/25" Pontoons, Table, Windshield, 25 Gallon Fuel Tank, Under Rubrail Lighting, Blue Ice Interior Light Package, Chrome Dock Lights, Ski Tow Bar, & Chrome Package. 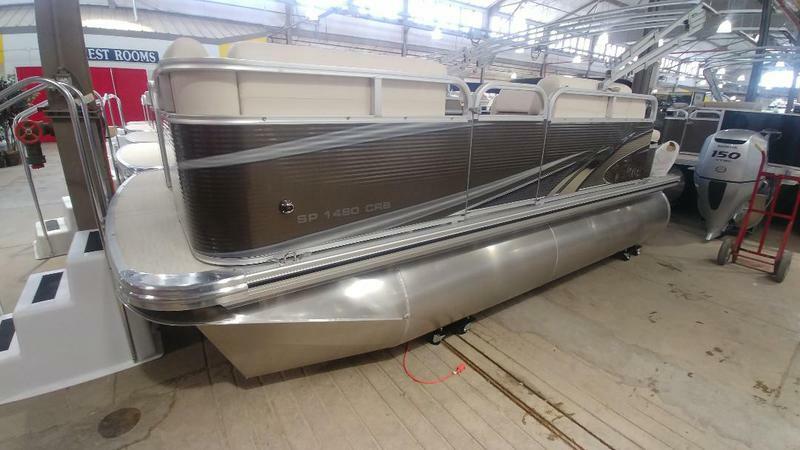 ADDED OPTIONS INCLUDED IN PRICE: Stainless Steel Propeller, Individual Seat Covers, Full Mist Vinyl Floor, SeaStar Hydraulic Tilt Steering, Silver & Oyster Shell Interior, Privacy Station, Stereo w/USB Aux Input & 4 Speakers, 8 ½’ Wide w/Triple 25" Pontoons, Wave Glider Package, Table, Windshield, 58 Gallon Fuel Tank, Under Rubrail Lighting, Blue Ice Interior Light Package, Chrome Dock Lights, Ski Tow Bar, & Chrome Package. 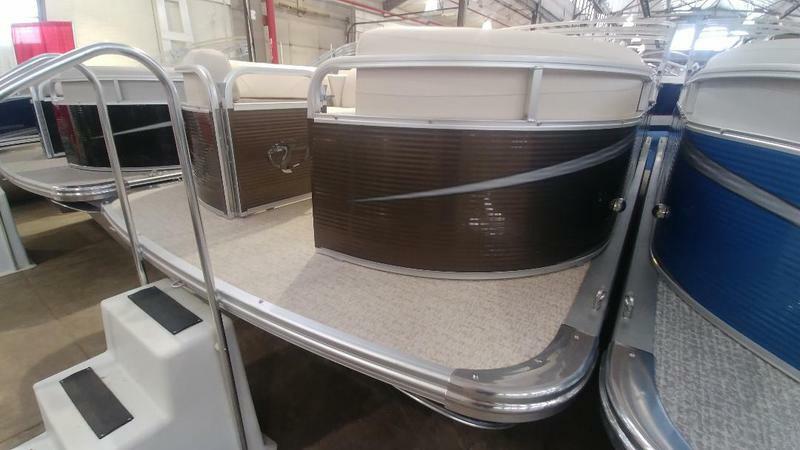 ADDED OPTIONS INCLUDED IN PRICE: Stainless Steel Propeller, Individual Seat Covers, Full Shore Vinyl Floor, Conch Shell & Oak Barrel Interior, Privacy Station, Sea Star Hydraulic Tilt Steering, Stereo w/USB Aux Input & 4 Speakers, 8 ½’ Wide w/Triple 25" Pontoons, Table, Windshield, Nav/Dock Light Combo, Dual Batteries, Interior Mood Lighting, Rear Fishing Station w/Livewell, Locking Rod Box, Sink, Sport Performance Package, 38 Gallon Fuel Tank, & Chrome Package. ADDED OPTIONS INCLUDED IN PRICE: Stainless Steel Propeller, Individual Seat Covers, Full Raffia Vinyl Floor, SeaStar Hydraulic Tilt Steering, Conch Shell & Oak Barrel Interior, Privacy Station, Stereo w/USB Aux Input & 6 Speakers, 8 ½’ Wide w/Triple 25" Pontoons, Table, Full Windshield, 58 Gallon Fuel Tank, Pull-Up Cleats, Dual Batteries, Dual Bimini Tops, Complete Black-Out Package, Under Rubrail Lighting, Lighted Wall Vents, Blue Ice Interior Light Package, Garmin GPS, Under Seat Matting, Black Dock Lights, Ski Tow Bar, Lighted Wall Vents, & HP Wave Glider Tri-toon Package. 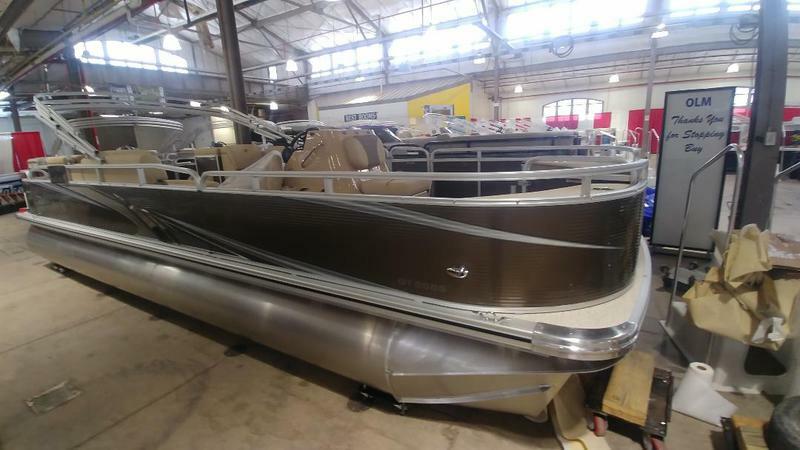 ADDED OPTIONS INCLUDED IN PRICE: Aluminum Propeller, Individual Seat Covers, Full Mist Vinyl Floor, Silver & Black Interior, Mechanical Tilt Steering, Privacy Station, Stereo w/USB Aux Input & 4 Speakers, 8' Wide w/25" Pontoons, Table, Windshield, 25 Gallon Fuel Tank, & Chrome Package.